24 October 2012: Fast Track Social Media Marketing for Small Business – to find out more and book online click here. Social media marketing is very important for any small business owners. 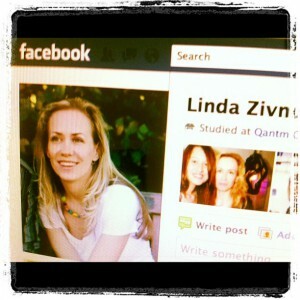 What does your business plan to get out of Facebook? Currently there are millions of failed “Business Profile” pages on Facebook, but there are also thousands of very successful ones. Most small to medium businesses use Facebook poorly, stumbling along without a clear plan and certainly not with the kind of strategy & momentum required to achieve the profitability they desire. One of the most exciting areas of Facebook is the continual innovations happening in Facebook Mobile – especially considering that already 47% of businesses are using mobile technology to promote themselves. Whether you’re looking for training so that you and/or your staff can get the most out of Facebook and stay at the cutting edge, or whether you want a company to manage the entire first phase, anywhere from 3 months to 12 months, we have many happy clients who are developing their Facebook ROI fast. Wanting to get going on Facebook ASAP? With 700 million users, 500 million of whom log in daily, we hope you do. We’ll empower you with clear strategies so you know what you’re doing with your personal page, and separately with your fan page: eg your fan page is maximised to attract hundreds of “likes” by offering a free gift, give-away or discount which your fans get by providing their email addresses – so you rapidly build your database. With the right approach to getting your numbers up, soon, like the Bodytrim example above, you’ll have fans actively supporting each other and building their friendships on your page. 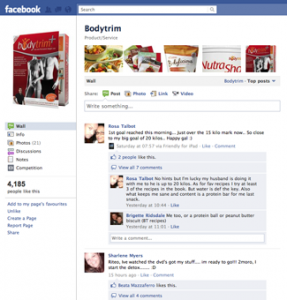 In fact since we took the image of our client Bodytrim’s page, it’s gone up past 12,000 fans. Now the community interacts within itself. Certainly the best example of a fan page we’ve been lucky enough to be involved with – may there be many more! We’ve enjoyed developing a number of alternate Facebook strategies which, if implemented in conjunction with our Facebook managers for 12 months, will give you a personal profile critical mass of close to 5000 ‘friends’ who are receptive to your business. The processes involve a myriad of well-strategised decisions – and grass-roots connecting day-after-day for 12 months. But we do it all for you, or as much of it as you wish – with you putting the icing on top. Can you get a lot of business out of Facebook? You betcha! Many of our clients now contact us through Facebook and also through Linked In. A few via Twitter. 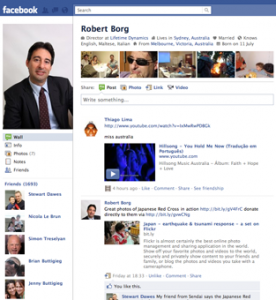 Three of our golden rules for building successful personal profile on Facebook are: 1. Subtlety; 2. Be entertaining; 3. Always be human! Facebook is a social networking website launched in February 2004 and operated and privately owned by Facebook, Inc. Users can add people as friends and send them messages, and update their personal profiles to notify friends about themselves. Additionally, users can join networks organized by workplace, school, or college. The website’s name stems from the colloquial name of books given to students at the start of the academic year by university administrations in the US with the intention of helping students to get to know each other better. Anyone age 13 or older can become a Facebook user. Facebook was founded by Mark Zuckerberg with his college roommates and fellow computer science students Eduardo Saverin, Dustin Moskovitz and Chris Hughes. The website’s membership was initially limited by the founders to Harvard students, but was expanded to other colleges in the Boston area, the Ivy League, and Stanford University. It later expanded further to include (potentially) any university student, then high school students, and, finally, to anyone aged 13 and over. The original concept for Facebook was borrowed from a product produced by Zuckerberg’s prep school Phillips Exeter Academy which for decades published and distributed a printed manual of all students and faculty, unofficially called the “face book”. The website currently has more than 400 million active users worldwide. Facebook has met with some controversy. It has been blocked intermittently in several countries including Pakistan, Syria, China, Vietnam, and Iran. It has also been banned at many places of work to discourage employees from wasting time using the service. Privacy has also been an issue, and it has been compromised several times. Facebook settled a lawsuit regarding claims over source code and intellectual property. The site has also been involved in controversy over the sale of fans and friends. There have recently been reports of Facebook proposing an initial public offering (IPO). However, Zuckerberg stresses that it will not be for a few more years, and the company is in no need of additional capital. Also, some analysts fear the Facebook IPO might be a particularly weak one. It remains that most small businesses who develop a business profile page are soon disappointed by the complete disinterest of most people on Facebook towards being spammed by an irrelevant biz profile, whether a group page, fan page or events page. There are much better ways to go in the first 3 to 6 months of your Facebook strategy. We’ve developed strategies which put us at the forefront of Facebook for Business in Australia – using Branchout, Company Profile Pages and not to be neglected, client’s personal pages used in confidential ways – but never spammy! We have many high quality social media clients in in Sydney, Melbourne, Brisbane, Newcastle, Canberra, Byron Bay, Lismore etc. Looking to read a social media marketing article about the lies that are spouted in Facebook for Business Courses & Workshops in Sydney Melbourne Brisbane & Australia … click on the linked text & enjoy. © 2018 Holistic SEO - All rights reserved.